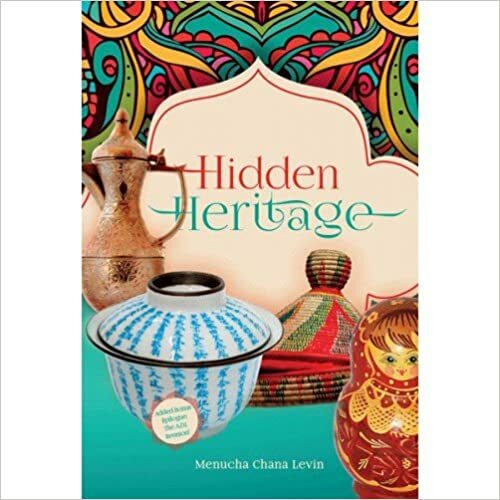 Menucha Chana Levin is the author of Sasson’s Book of the Month for February, Hidden Heritage. You can buy the book HERE. Although we had been blessed with four children, my husband and I always felt as though our family was not quite finished. After several disappointing miscarriages, we seriously considered fostering or adopting a child, but nothing ever worked out. All too soon our kids had grown and flown away to school or jobs but we did not feel ready for an empty nest yet. We found the sudden silence of our empty home oppressive, missing the vibrancy, noise, laughter and chaos that children can provide. Looking and feeling far younger than our years, we believed we still had the ability to parent another child or two. We wanted a more permanent, less heart-breaking arrangement than the foster system so we began to seriously consider adopting, spending over two years researching both domestic and international adoption. I started a support group called Four Corners Families for people who had adopted children from diverse places such as Guatemala, Russia, Romania, Ethiopia and China. They all felt their children had been chosen for them by Hashem. Speaking to these families gave us hope that the adoption process, though very complicated, was indeed possible. Then came the intensive research of various countries and adoption agencies. Finally we selected an ethical agency whose main goal was to find families for older children, not just the healthy baby girls most people wanted. They sent their social worker to meet us and conduct our home study. We were approved and decided to adopt two Ethiopian children, a girl aged twelve and her brother aged six. The minute we saw a photo of their cute smiling faces, we felt they were destined to be ours. Still, our adoption journey was long and complicated, involving bureaucratic wrangles and one frustrating delay after another. Did we have doubts and fears along the way? Definitely. We talked for hours – were we truly making the right decision at this point in our lives? Yet, despite everything, we felt compelled to continue the process or we would always regret it. My lifeline was other families who had adopted Ethiopian children. Our emails flew back and forth late into the night, my anxious questions receiving reassuring answers only those who had been there, done that, could possibly provide. Then at last the long roller-coaster journey came to an end. The adoption was finalized and one bright afternoon, we met our new kids. Seeing them in reality, our doubts and fears began to melt away in the sunshine. Life was very different from then on, both for them and for us. Older adopted children bring along baggage from their pasts and ours were no exception. Adopting them was certainly the most challenging, emotionally stressful thing we’ve ever done but at the same time the most significant, life-enhancing and rewarding. There was so much for them to learn – and we learned right along with them. Being an inter-racial family, people tended to stare at us, two brown-skinned youngsters with a white couple old enough to be their grandparents. But after a while our new kids became an accepted part of our community. We learned to march to a different drummer as a conspicuous family. We discuss our color differences at times and point out that they love vanilla ice cream while I prefer chocolate. Our kids gave us a rare opportunity to turn back the clock. Suddenly we were ‘young’ parents again, attending PTA meetings and soccer games, helping with homework, and most enjoyable of all, reading bedtime stories, singing Shema Yisrael and Hamalach hagoel. Just as our children adapted to our culture, we tried to incorporate some elements of theirs into our lives. We learned a few basic words of Amharic, became friendly with some sweet Ethiopian teenage girls in our neighborhood and I kept in touch by email with other adoptive families of Ethiopian children. One afternoon we were walking past a dumpster on our street when our son noticed a huge teddy bear perched on top of it. His brown eyes went wide. “Why they throw away a nice bear?” he asked, shocked. “Maybe the kid who owned him doesn’t need a teddy bear because now he’s grown up,” I suggested. For a moment I was stunned. Our kids are well aware that they are our ‘second-time-around’ children but we’d no idea how normal a process they thought it was. We rescued the teddy bear, perfectly clean and in great shape. Perhaps on some level our son identified with it. Someone else no longer wanted it, but he sure did! Though it was a huge bear, taking up a lot of space in his bed, he slept with it every night. It was exactly the right size to fill his heart, as our chosen kids have filled ours. Thank you, Menucha Chana and your husband for setting such a lofty standard in emulating our Avinu sheBashamayim! Even if this kind of precious kindness and growth opportunity isn’t right for us at this time – the awareness of giving more of ourselves to the ones in our midst has just become ever more crystal clear and delicious! May you reap shefa nachat from all your children and grandchildren!